Competition for limited water resources in the western United States is increasing, as are the costs for moving irrigation water. In most western states, irrigated agriculture is the largest single consumer of water. To help improve irrigation efficiency, the Bureau of Reclamation and Bonneville Power Administration partnered to create a network of automated agricultural weather stations in the Pacific Northwest known as AgriMet (Agricultural Meteorology). 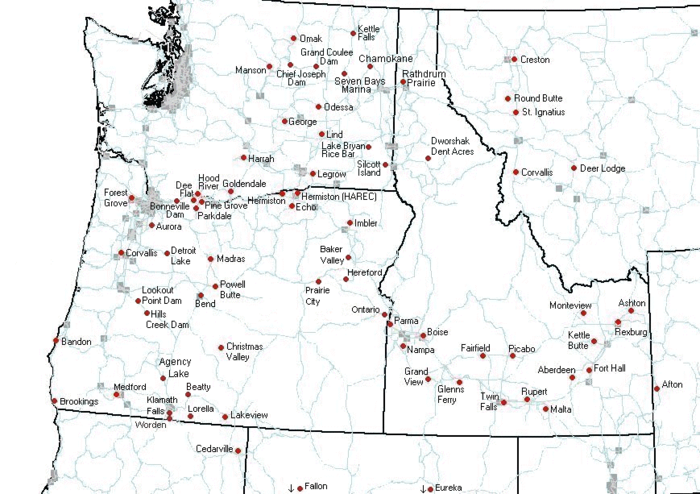 Having begun with an initial installation of three stations in 1983, AgriMet now gathers meteorological data from 72 stations throughout Idaho, Montana, Oregon, and Washington, with additional stations located in northern California, western Wyoming, and Nevada. Each AgriMet station is solar powered, using a photovoltaic panel to recharge a lead-acid battery. The stations collect data required for modeling evapotranspiration (ET). Measured parameters include air temperature, precipitation, solar radiation, wind speed and direction, and relative humidity. Some sites have special sensors to measure soil temperature and moisture, crop canopy temperature and humidity, diffuse solar radiation, pan evaporation, and leaf wetness. Each AgriMet station is configured with sensors, a Campbell Scientific CR10X datalogger for data collection and processing, and a TX312 HDR GOES for data transmission. The CR10X measures each of the sensors once every second. The data is transmitted from the station via the Geostationary Operational Environmental Satellite (GOES) to the receiver site at the regional office in Boise, Idaho. All of this information is available on the Internet and is integrated into various on-farm technical assistance programs by local agricultural consultants, the Cooperative Extension Service, and the USDA Natural Resources Conservation Service. Use of AgriMet information in irrigation scheduling results in water and energy savings, reduced soil erosion, and protection of surface and ground water supplies. Various agricultural consultants have reported water and power savings ranging from 15 to 50 percent. Some irrigators have reported real savings of as much as $25 per acre in pumping costs after using AgriMet ET data to schedule their irrigation. AgriMet not only provides information for irrigation water management, all of the current and historical weather information is available on the AgriMet website for a variety of user applications. Weather data is transmitted hourly from each station, and is almost immediately available on the website. This near-real-time availability of weather data from the AgriMet network finds many uses. The National Weather Service uses the hourly data for short term forecasting and forecast verification. Weather and ET data are used by state DEQs for investigating pesticide application and ground-water contamination issues. Electric utilities use the information to model heating, air-conditioning, and peaking-power requirements. The success of AgriMet in the Pacific Northwest expanded east of the continental divide in the 1990s. The Great Plains Cooperative Agricultural Weather Network maintains and monitors 22 AgriMet stations in central Montana. More information can be found on the Bureau of Reclamation Pacific Northwest AgriMet website at www.usbr.gov/pn/agrimet and for the Great Plains AgriMet program at www.usbr.gov/gp/agrimet. Stay informed with our latest updates by following Campbell Scientific Australia.